Located at the cinematic setting of Ammoudi, Dimitris is the last taverna as you pass by a row of many other tavernas. 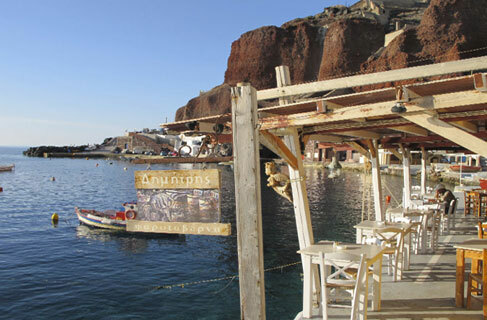 Its history dates back to the 19th century when Ammoudi was the haven of Oia. Dimitris is an expert in fresh fish and how to prepare it in the best way. Right by the sea overlooking the picturesque bay, this is the ideal place to enjoy your meal during sunset (which lasts longer here).